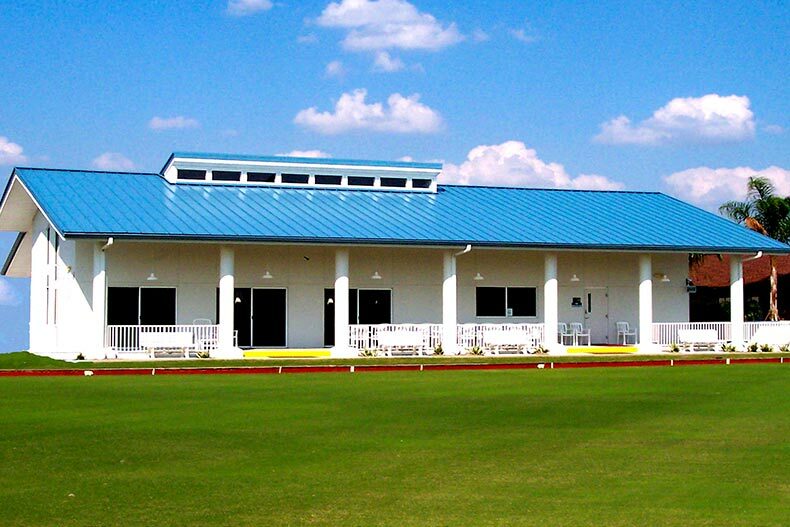 Amenities in Kings Point are so varied they even include a clubhouse for lawn bowling. With 5,277 attached single-family homes, the 55+ community of Kings Point in Sun City Center, Florida offers activities, amenities, and an easy drive to the shops and restaurants in the greater Sun City Center community. Residents in this community are right off I-75, which provides access to Tampa, Sarasota, the Town Center Mall, and the Hard Rock Casino. Kings Point is a gated community that maintains separate condominium associations from the Sun City Center Association. The community lies within Sun City Center, but a legal boundary keeps it independent. Older models provide a covered carport for parking, and newer homes come with a two- or three-car garages and a patio or covered lanai. The resale homes at Kings Point are built in duplex models, and most of the homes range in size from 800 square foot condos to homes with 2,000 square feet. Homes are available with a golf course or pool view, and there are also hundreds of properties that come with a view of ponds, lakes, and trees. Each association at Kings Point is different and comes with a separate set of rules, regulations, and fees. All homeowner fees include the use of pools and other amenities as well as basic cable, landscaping, trash removal, water, and security. Amenities in the community vary widely and include four separate clubhouses. Kings Point is home to a 97,000 square-foot clubhouse as well as 20,000 square-foot south clubhouse. Between the two they feature a cafe, fitness center, spas, indoor and outdoor pools, a theater, sport courts, and several hobby and game rooms. Residents also have access to two Sun City Association amenity centers. They include tennis courts, a softball field, heated pools, and miles of walking trails. There is truly a way to stay active for every different active adult. The calendar of events scheduled by the clubs and organizations at Kings Point is extensive. Residents can participate in bridge, play shuffleboard, take a ceramics class, or join a discussion group. There’s a model railroad club, quilting, and clogging. Homeowners can even learn to line dance and take an economics class. Fitness is also the focus at Kings Point. Zumba, yoga, and Pilates are popular classes to take in the fitness center. There’s also water aerobics, tennis, volleyball, and basketball available. If there’s any lingering soreness after a workout, residents can book a massage at the Serenity Spa and Salon in the clubhouse. Golfers can enjoy the three courses at Kings Point or venture into greater Sun City Center, where there are eight courses to play. Sun City Center attracts 55+ homebuyers from all across the country who want to retire into the warm sunshine and enjoy the Florida climate without giving up an active, growth-oriented lifestyle. From Sun City Center, it’s easy to visit art museums in Tampa, stroll along the waterfront in St. Petersburg, or enjoy a day at one of Sarasota’s beautiful beaches.